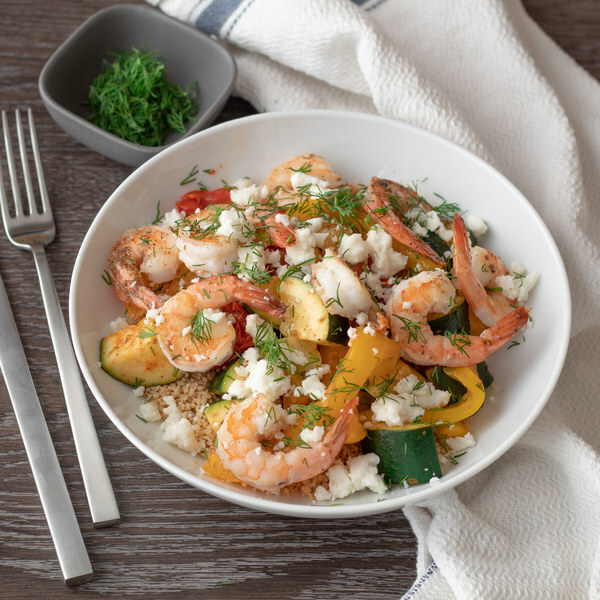 ← Shrimp Couscous with Tomatoes, Zucchini & Feta. In a small saucepan, bring broth to a boil over high heat. Remove from heat, add couscous, and stir. Cover and let stand for 10 minutes then fluff with a fork. If using frozen shrimp, place them in a colander and run under cold water to thaw them slightly and remove any ice crystals. (If using fresh shrimp, skip this step.) Place the shrimp on a clean towel or paper towels and pat dry. Halve tomatoes. Cut peppers into quarters, remove seeds and membranes and slice into strips. Medium dice the zucchini into ½-inch cubes. Transfer cut veggies into a medium bowl. Add the shrimp and garlic to the skillet; cook until shrimp are opaque, 1-2 minutes per side. Once done, transfer to a plate. Return skillet to the heat, add oil and swirl to coat the bottom. Add peppers, zucchini, tomato, and oregano to the skillet, stirring occasionally until vegetables soften, 3-4 minutes. Shave dill leaves from stalk; discard stalk and mince leaves. Once veggies are soft add broth, scraping up any browned bits, and cook until most of the liquid has evaporated, 4-5 minutes. Add dill to the skillet, along with the shrimp and any accumulated juices; allow to cook for 1 minute more. To serve, divide couscous between plates and top with the shrimp, veggies, and crumbled fetta. Enjoy!